For our Christmas entree, we decided to make chicken with a Jewish twist (go figure). This chicken is great because it is pretty easy to make and is really a one pan meal – it has protein, veggies, and carbs. And for those of you learning about tsimmis, it’s typically a sweet stew of prunes, carrots, and sweet potatoes with cinnamon and honey. 2. 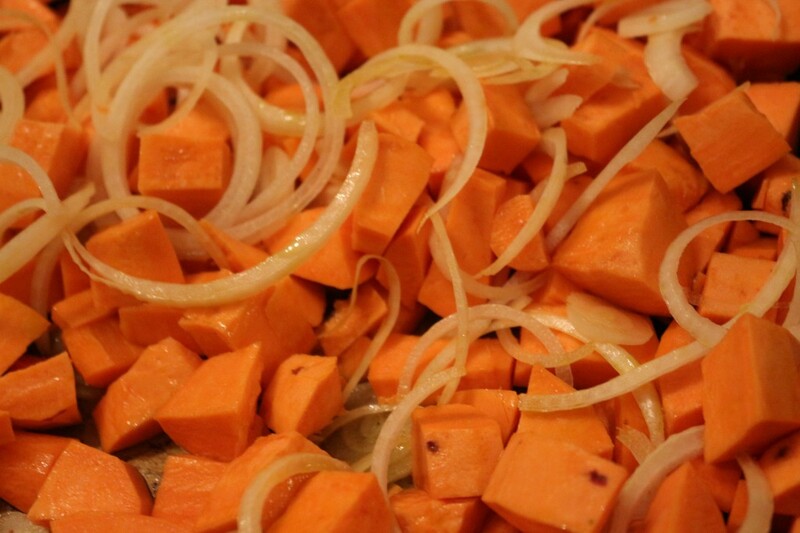 In a large roasting pan, combine the sweet potatoes, carrots and onion with 2 tablespoons olive oil. 3. In a bowl, combine together the spice rub – the turmeric, paprika, coriander, cumin, salt and pepper. 4. Nest the chicken breasts in onion/potato/carrot mixture. Rub the 1 extra tablespoon olive oil on each chicken breast, and then rub the breasts with the spice mixture (on both sides if possible). 5. 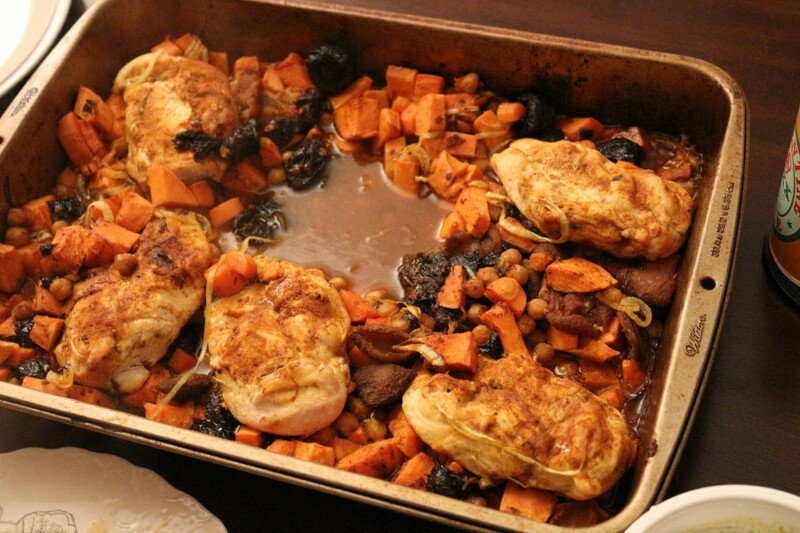 Put the chicken and potatoes in the oven for 30 minutes to cook. 6. In the meantime, in a large saucepan, combine the chicken broth, brown sugar, cinnamon, prunes, apricots, garbanzo beans and saffron. Bring to a boil, and then reduce to a very low heat until the 30 minutes are up. 7. When the chicken has cooked for thirty minutes, remove it from the oven. Reduce the temperature to 350 degrees. Then, pour the prune mixture over the potato mixture (pushing the chicken breasts to the side momentarily). Then again, nest the chicken breasts in the mixture, cover the breasts with some of the mixture and juices, and cook for another 35 to 45 minutes until the chicken is fully cooked. 8. Remove from oven. When serving, be sure to include some of the juices in the pan, and garnish with cilantro. 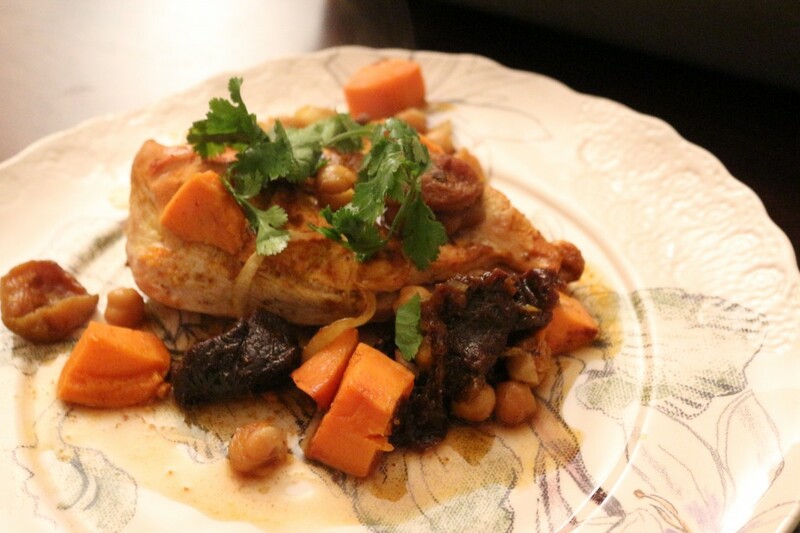 This entry was posted in Mains and tagged Beans, Carrots, Chicken, cinnamon, Gluten Free, Jewish Foods, Potatoes. Bookmark the permalink.